Inside, Out. Portrait of the Self. Oil on canvas. 1978. 60 x 72 inches. Private Collection, St Louis, MO. Our electronic footprint follows us even after we pass. Posts on FB from deceased friends pages and caller id's whose names are embedded with the number remain. Taken aback when the name on the phone was a former collector who had passed suddenly a couple of years ago. I cheerfully answered assuming it would be his wife and it in fact was. Inside, Out. Portrait of the Self is indeed an old friend that I had not seen in years. And many other important works of mine in various media have been happily placed in their home and collection. The call was to say goodbye as the home sold and my collector moving to the mid west. I was to have an opportunity to visit other old friends and photograph them before they were relocated. This particular work has always been special. The idea came in clearly as I rode the train between Rome and Florence. It was my final quarter in a quarter abroad teaching assignment and I was heading north for the weekend to see new friends before returning to the states. I remember sketching the idea in the back of the book I was reading. A color sketch was made upon my return. Study for Inside, Out. Portrait of the Self. 20 x 26 inches. I neglected to photograph a large scale color pencil drawing on black paper, perhaps overwhelmed but seeing so many old works, long out of my thoughts. Rather than selling some work in order to downsize Pat offered to return the work to me to do as I please. This drawing has now come home to mama. On the advise of my wise college professor, Phil Sultz when i asked for an assignment post graduation, i was encouraged to draw and a direction of which to paint would present itself through drawing. And so I proceeded to draw for the next three years. I had access to as many color pencils I would need and time to work in-between students buying art supplies in the college art store where I worked. Only a handful of these works remain in my collection. I will save digging them up for a later post. Today I would like to reintroduce some old friends to you. Between Day and Dream. 1980. Oil on canvas. 72 x 60 inches. Private collection. It was so great to be able to see and photograph this painting before leaving for St. Louis. This painting was exhibited in museum competitions in Ft Lauderdale and Palm Beach and combines many of the directions I had been pursuing in my painting from the late 70's. I am enjoying the fact that it will be in Missouri, where I first truly discovered that I had a passion for art. I have also always enjoyed working with clay. I have incorporated dimensional elements in many pieces throughout my 40+ years of making art. I am happy to have this little fun work back in my collection. Another Performance. 1981. 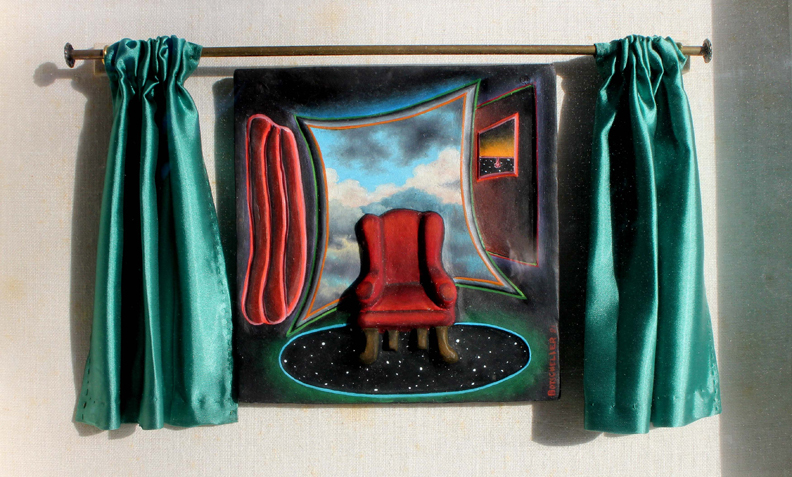 Oil on clay with curtains. Framed in a shadowbox lined with linen. Collection of the artist. Even as a student I loved exploring variety of media and was encouraged to do so. The idea of Hybrid strategies is now new. The enjoyment is being able to make things. The work reflects everything I am thinking about, reading, and living and seeing. The media may just have been what I had on hand at that moment or the beginning of a demo I began in class for my students. I do have a long history of using gouache on illustration board or as this example, on canvas. No title. no date. Gouache on canvas. 20 x 16 inches. Private collection. This gouache painting was applying eastern and western conventions of space and pattern. The flower as art on the wall reflected my very first artwork that I made when I came to Florida. After the flowers I returned to drawing and this brings this post full circle.